Home» Garrick News » Panto Time at the Garrick! Panto Time at the Garrick! 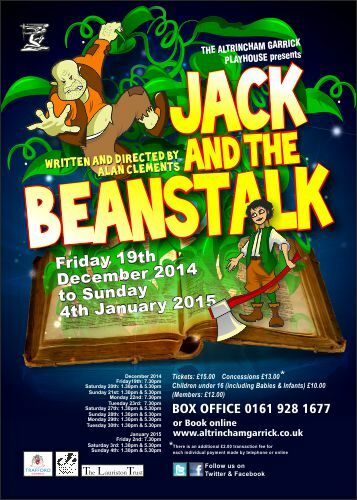 It looks like we are heading for another festive SOLD OUT run – before our ?tradition family panto even opens!!! So book ?if you are still planning to come and see the show – ?before it’s too late – only 18 days until our opening night! Every Christmas and New Year we need more help than usual!!! – either in the Kiosk (selling ices), the Coffee Bar or our Front of House selling programmes & taking tickets – our volunteers do a wonderful job – but at this special time of year we need more help…YOUR HELP! – just one show? an evening/afternoon? – the Playhouse only exists because of our members and the efforts they make to support each other. If you can please help, even for that one show, contact admin@altrinchamgarrick.co.uk – it’s a great way to start at the Playhouse, with so many more departments to discover and join! Please play your part, and support your local Playhouse – thank you.